The tantric Buddhist tradition of the Lam 'bras, the "Path with the Result," has been practiced in Tibet for almost a thousand years, most prominently within the Sakya lineage. 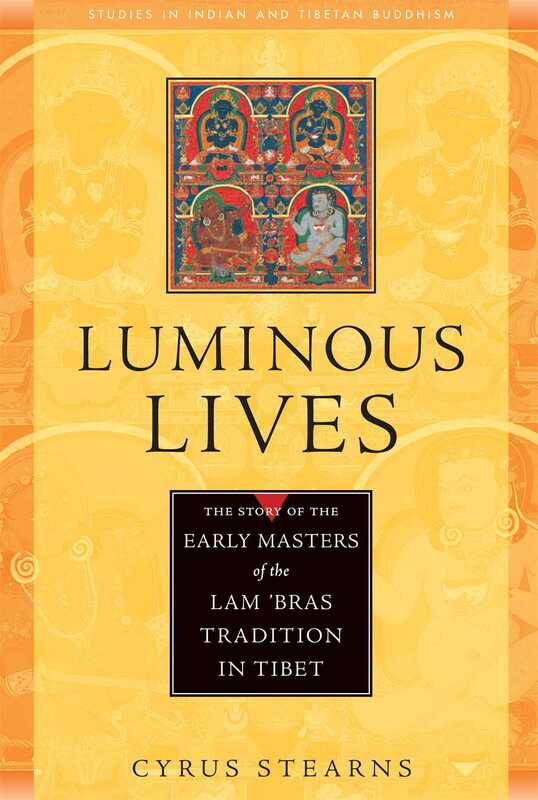 Luminous Lives is the first in-depth study of the literature and history of the Lam 'bras in Tibet. The central focus of the work is a rare Tibetan history that brings alive the story of the earliest men and women practitioners of the Lam 'bras. This text, recording the words of the great Sakya Pandita (1182 - 1251), was a major source for all later histories of the tradition. Recently rediscovered, it has been reproduced here along with Cyrus Stearns' excellent translation, introduction, and annotations. Luminous Lives opens a window into the world of one of the great traditions of tantric Buddhism in Tibet. Cyrus Stearns first began to study Buddhism with Dezhung Rinpoche (1906-87) in 1973. Since that time he has studied with and translated for many Tibetan teachers, especially Dezhung Rinpoche and Chogye Trichen Rinpoche. Cyrus has a PhD in Buddhist Studies from the University of Washington and lived for about eight years in Nepal, India, and Southeast Asia. Among his other publications are The Buddha from Dolpo, Hermit of Go Cliffs, and Luminous Lives. Cyrus has three daughters and lives on Whidbey Island, Washington. "Cyrus Stearns, an eminent scholar of Tibetan Buddhism, presents a seminal manuscript history of its earliest practitioners and masters, and a detailed description of the Lam 'bras teachings. At the heart of the book is Stearns's translation of a newly-discovered text that records the words of the great teacher Sakya Pandita, featuring Tibetan and English on facing pages. This book will be of particular interest to students of the Sakyapa tradition." "Cyrus Stearns presents in this book a rare manuscript history of the Path with Its Fruit instructions, the teaching that is at the very heart of the Sa skya school of Tibetan Buddhism. He proves himself to be one of the best Tibetan translators working today, capturing faithfully and movingly both the spirit and literal sense of his thirteenth-century author. He also demonstrates his prowess as a text discoverer: as in his previous Hermit of Go Cliffs, Stearns here makes accessible a precious work that was until recently unavailable even to the masters of the tradition." "Stearns' survey of the oldest Lam 'bras literature with the admirable translation of a collective biography of the early masters of the tradition is a wonderful contribution to our knowledge of an unexplored area in Tibetan cultural history. Stearns has an excellent control over his subject and this is a worthy successor to his Buddha from Dolpo."